Not so long ago we heard the tragic tale of the death Louis, Dauphin of France, Duke of Burgundy. Louis's family was decimated by a measles epidemic that left the Bourbon succession in crisis. 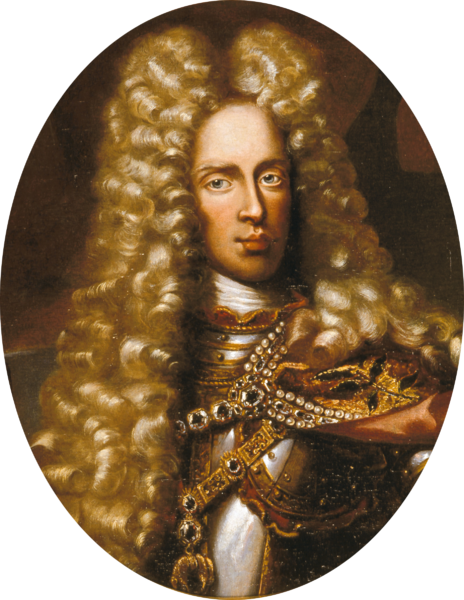 In fact, it was not the first time European royalty had been laid waste by illness and four members of Louis's own dynasty died in a a smallpox epidemic that also killed our guest today, Joseph I, Holy Roman Emperor. In early 1711, smallpox swept through Europe, leaving a trail of death in its wake. Social standing, privilege and wealth were no protection against the virulent infection. As thousands died across the continent, the ailing Joseph took to his bed in the Hoffburg Palace under the watchful eye of his physicians. The doctors immediately embarked on their standard round of treatments, bleeding their patient in an effort to lessen his suffering. As he neared death, Joseph called his wife, Wilhelmine Amalia of Brunswick-Lüneburg, to his bedside. Their twelve year marriage had not been a happy one and was blighted by Joseph's numerous affairs and liaisons with all manner of women. In fact, Joseph contracted syphilis in 1704 and passed the infection on to Wilhelmina Amalia, an incident that apparently rendered his wife infertile and resulted in the Emperor leaving no male heir at his death. Aware that he was dangerously ill, Joseph promised his wife that, should he survive this illness, he would become a faithful and dutiful husband. The couple were never to learn whether Joseph's promise was in earnest. He was not fated to survive the smallpox infection and died on 17th April, aged 32. Three days later he was buried with much ceremony in the Imperial Crypt of the Capuchin Church. His body lies in a tomb designed by Johann Lukas von Hildebrandt; it is decorated with scenes of Joseph's victories in the War of Spanish Succession, a suitably grand final resting place for a Holy Roman Emperor. I love your articles on history. Learn more every time you make a post. Thank you for sharing. That's very kind; thank you for reading! The term "Holy Roman Emperor" always strikes me as such a presumptuous and hypocritical statement! No wonder these guys often suffered tortuous deaths like this one. And, as your description highlights, these religious zealots were so violent in their proclamation of the faith - I dread to read between the lines of Joseph's '...victories in the War of Spanish Succession..."
Between 350,000 - 400,000 people lost their lives in the War of Spanish Succession and hostilities crossed the globe. Interestingly, it also did wonders for piracy as so many privateers found themselves without gainful employment once the peace treaties were in place! I believe that one of my ancestors was born of a sexual affair between a young woman of the Petmecky Family. This was a small family of little importance, however the Emperor went out of his way to knight them, and what did they do? They left Austria, never to return. They left Austria the same year they were knighted, and the same year that a child was born with the name JOSEPH Jacob Petmecky. That sounds like a very tantalising family mystery!